TRAIN services on nearly all South Western Railway routes have been reduced or withdrawn as the first of a series of strikes begins in the continuing dispute whether guards or drivers should control the doors and despatch trains. SWR has warned that there will be no trains at all from Teddington to Shepperton, Surbiton to Hampton Court, Yeovil Junction to Exeter St Davids, Weybridge to Virginia Water, Guildford to Aldershot or Ascot to Ash Vale. There are no special replacement bus services on the Shepperton or Hampton Court branches. Services run by SWR are also withdrawn between Bristol, Westbury and Yeovil Junction, Leatherhead and Dorking, and between Westbury and Salisbury, although other operators also cover these sections. The only SWR route with a normal service is the Island Line, between Ryde and Shanklin. 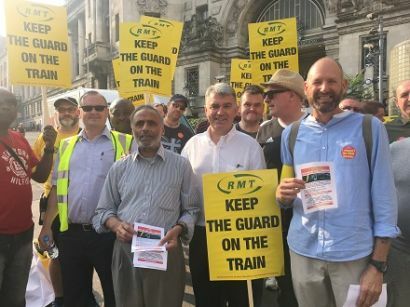 RMT general secretary, Mick Cash said: "RMT members are standing rock solid and united again this morning across South Western Railway in the latest phase of the campaign to put public safety, security and access before private profit. Travelling is also being made more difficult by the extreme heat, with temperatures expected to reach 35 C in the south east of England today. Unless new talks can be convened and progress is made, further strikes are planned on 28 and 31 July, 4, 11, 18, 31 August and 1 September.